The Cherry Mobile Cosmos X2 has been secretly giving appearance in selected CM kiosks nationwide this week. This rebranded Konka V981 sports a stunning Samsung-ish 1280x720 pixel Super AMOLED HD display that is treated with Corning Gorilla Glass 2. It's internals are classified by a 1.2 GHz quad-core MediaTek CPU, 1 gig of RAM and a 16GB internal storage. Its rear camera touts a whooping 18 megapixel sensor with BSI technology.Plus, the 2200 mAh battery will juice up all your favorite apps and camera stills. The X2 is by far best looking phone in the Cosmos line. It throws in a 4.8-inch screen real estate and is a reminiscent of a todays Android flagship phones. 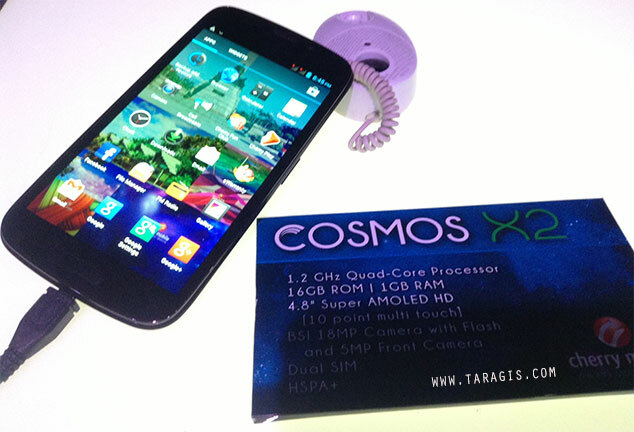 Personally, Cosmos X2 is the best value-for-money phone among its brethren. The 5 megapixel front camera may not be at par with the the Cosmos X's, but its power efficiency (2200 mAh battery) would keep you on road longer than you've expected. Plus, a better vesion of Jelly Bean (Android 4.2) would keep everything intact. It's now available in selected CM kiosks nationwide. Check out the rest of the specs below.